Notice there are different size metal hoops you can buy. We recommend a 5 or 7 inch for the class so you can get it completed during our meeting. 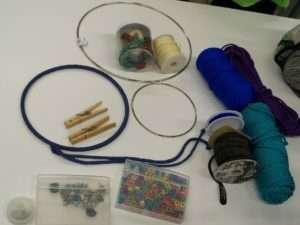 Decide what color you want yours to be and what type of cording, pearl cotton thread, waxed cotton, embroidery floss, yarn, etc that you want to use. You will need a couple of clothes pin during the making of the Dreamcatcher. 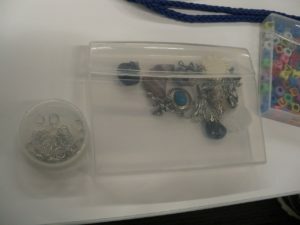 There is a close up showing charms and beads and the tiny metal rings you use to put the charms and/or beads onto your dreamcatcher. Bring something you like. We should start this about 6pm so you will have plenty of time to work on it. You are always welcome to bring your project to work on while we are having the class. Hope to see you there.